Riot's been semi-regularly updating the community on its infrastructural progression, and so far so good. I've actually noticed a reduction in my average ping over the last few weeks—which, granted, isn't entirely necessary when my champion pool mostly consists of heavy close-range bruisers. Skill shots? That's for mid laners to bother with. I just want to run up and hit people. But it does help. And their eventual plan to develop what is effectively a semi-private nationwide routing network has great implications for the development of North American esports by reducing the artificial limitations on skills development for more easterly players. Right now, west coasters have a significant advantage—30 ms from San Jose versus 100+ is basically the difference between reacting and predicting. 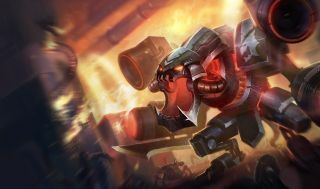 While there is certainly value in developing strong predictive skills in-game, which is the basis of Madlife's legend-inspiring Thresh and Blitzcrank play, a player's mechanical strength is based at least a little on the speed they react to developing situations in a fight. Especially in solo queue. Granted, it isn't the only thing, or arguably even the most important. Low reaction speed can be compensated for with a good team composition and strategic planning. Sure, you might be liable to miss crucial Smites or whiff difficult Glacial Prisons, but a good understanding of blind points, play patterns and ability abuse has lifted even the most remote players to the top of solo queue rankings. Case in point: AHQ E-Sports Club's own ace in the hole. Liu "Westdoor" Shu-Wei is a feared local legend, dominating not just the Taiwanese Garena servers but slashing through the ranks of North America and even Korea in yesteryears. The average ping from Taipei to Los Angeles? 166 on a good day, or ten times that of an LCS pro duking it out somewhere in the vicinity of Santa Monica. Sure, Westdoor is incredibly skilled, but given that he made his name off Twisted Fate's fire-and-forget Gold Cards (as opposed to Riven's frame-by-frame intricacies) it's clear that "skill" in League of Legends extends past just reactionary play. That said, an east coast server is probably going to be necessary in the long run, and not just for ping parity. There's a metagame aspect that is oft-overlooked: all of Asia's involved in a coordinated conspiracy to keep the world championship trophy to themselves, and it's got a lot to do with their server regions. I've verified it over the spring split with multiple teams, on the record. Heck, LMS teams have said so on video (albeit in Mandarin, so mostly to the ignorance of Reddit et al). It's not exactly a big secret, just one that's often overlooked by the region-specific narrative espoused by most commentators. Shanghai, Seoul, Taipei: three server regions, but one practice circuit. While Korean and Chinese teams do focus primarily on their domestic circuits, thus forming the particular metagames and trends of each region, they regularly swap notes and test the strength of each other's best. It's why, for instance, Westdoor popped out the Cho'gath mid pre-Cinderhulk. Korean solo queue's been using it as a LeBlanc counter since early spring, the conical Silence on Feral Scream doing a serious number to what was then an assassins-heavy meta, dependent on champion ability and burst potential. It was weeks later until the west picked up on it, and by then it was less about shutting down assassins and more about providing another layer of meat in front of the AD carry. It is, I suspect, a major reason for the eastern regions' continued strength. The Korean exodus did more than just weaken KeSPA's stranglehold on esports success—it's networked the eastern hemisphere regions into a loosely organized competitive federation. Though not one without its pain points. In Taipei, for example, the Taipei Assassins have caught a little flack over their scrim schedules. Sure, it makes perfect sense for them to want to spend a lot of time scrimming Korean teams—it's why they brought in a Korean coach in the first place, to provide that sort of networking opportunity. For them to do so almost at the exclusion of their fellow LoL Master Series teams, though, has engendered a little ill will. There is some nationalism with the Wolves and AHQ in that they're working to redeem Taiwan's reputation in international esports, yet the Wolves claim that it's easier to get scrims with GE Tigers than it is with TPA! But even with neighborly issues, it's hard to pretend that the Taiwanese teams haven't undergone substantial improvements this year. Their exposure to the practices and habits of Chinese and Korean peers has greatly expanded their playbooks and tightened their mechanical executions—in lieu of actual international competition, they can at least have international practices to keep them truly ready come the MSI and Worlds. That's not possible for EU and NA teams. The last time that the two regions were interconnected was back in 2012, when TSM was an East Coast team and bearing with 150+ ping to occasionally practice against their Old Country counterparts. Nowadays, the only cross-cultural interchange is between North America and Japan—and it's mostly Japan stuck playing on NA servers by virtue of lacking their own, and they're too new to really offer much in terms of experience to the more established North American scene. That's going to impede western strategic development. It probably already has. It is by no mere accident that Europe's picked up a reputation for sluggish, grinding play, and no accident that TiP so rapidly tore through established North American teams back when they were LMQ and staffed entirely of Chinese players. It is natural for a region to copy the play styles of their most successful teams, but the insulated nature of the western regions means their best teams have very few opportunities to learn how they might get punished by somebody working off a wholly different set of assumptions. Thus: a trans-Atlantic server. Or, at the very least, deliberate effort to extend Riot's ongoing network development program with the trans-Atlantic connection in mind. And, if at all possible, with Brazil in mind as well, as the rapidly developing CBLoL program is arguably mature enough to deserve a guaranteed Worlds seed in 2016. What might that cross-pollination result in? Better League. Better play. Less 50+ minute European snoozefests as teammates bicker and snark—at each other—over how best to not shut out a game when they're ahead. It's not as if Chinese games don't run the clock either, but it's much rarer—and even when they do, the kill tallies pile up like an avalanche over the entirety of it. I think that's something we can all approve.